what is the round veggie is growing between my cucumbers? So I have a little garden and in it I have mostly cucumbers, two eggplants, one watermelon and two zucchini plants. Now zucchini plants didnt bear any fruit, just lots of flowers, I have couple of eggplants, plenty of cucumbers and in between quite a few strange looking big round green fruits. What are these? Can it be a result of cross-polination or something edible? Are they the apple cucumber variety? Try eating them and see, they could be a cross and be a winner, or NOT! Zucchini flowers need pollinating by bees or do it yourself with a little brush or rub a male flower over a female flower early mornings. 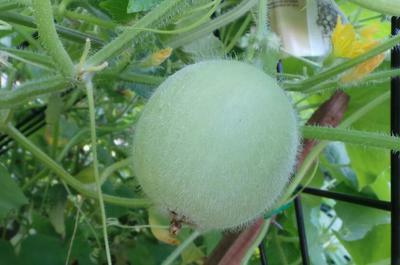 If your round fruit are on separate vines from the other vines, they could be some sort of those honeydew melons, or as I say apple cucumbers, or MUTANTS. Curious. we planted a different cucumber seed this year as I couldn't get all female cucumber seeds. 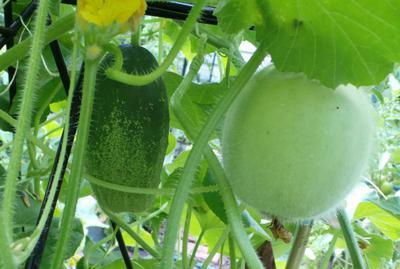 They looked like corgette plants with huge flowers, but have produced round cucumbers, like your picture. If it tasted like a cucumber and had fuzz on it, it is most likely a Carosello (in the Melon family). These cucumbers are bitter-free, burpless and do not cross with the regular cucumber varieties, but will cross with Cantaloupe and other melons. There are quite a few of these varieties (with stripes, long, short, etc.) at Cucumbershop.com. I planted 3 Cucumber plants in seperate pots, 1st one raged away and produced lots of yellow cukes. The other 2 plants did nothing forages then flowered and produced some very small cuke about 1" long, I was about to give up on them when I spotted just one fruit about 8" dia on each plant but they are different one has a fuzz covering the other has dark green flecks, can't wait to see what they taste like !! !